Norman Love Confections BLACK collection of premium single-origin dark chocolates celebrates the divine flavors of five unique cocoa producing region: Ghana, Dominican Republic, Peru, Tanzania, and Venezuela. With cocoa percentages varying from 68% to 88%, these beautiful jewel-like confections are sure to please any dark chocolate connoisseur. Impressively presented in an exquisite black hexagonal hinged box. 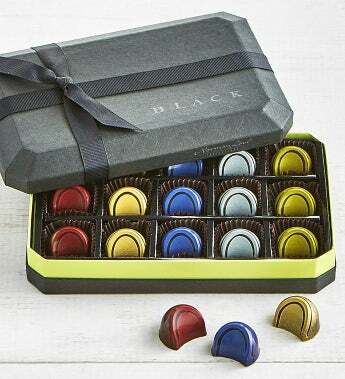 Norman Love Confections BLACK collection of premium single-origin dark chocolates celebrates the divine flavors of five unique cocoa producing region: Ghana, Dominican Republic, Peru, Tanzania, and Venezuela. With cocoa percentages varying from 68% to 88%, these beautiful jewel-like confections are sure to please any dark chocolate connoisseur.